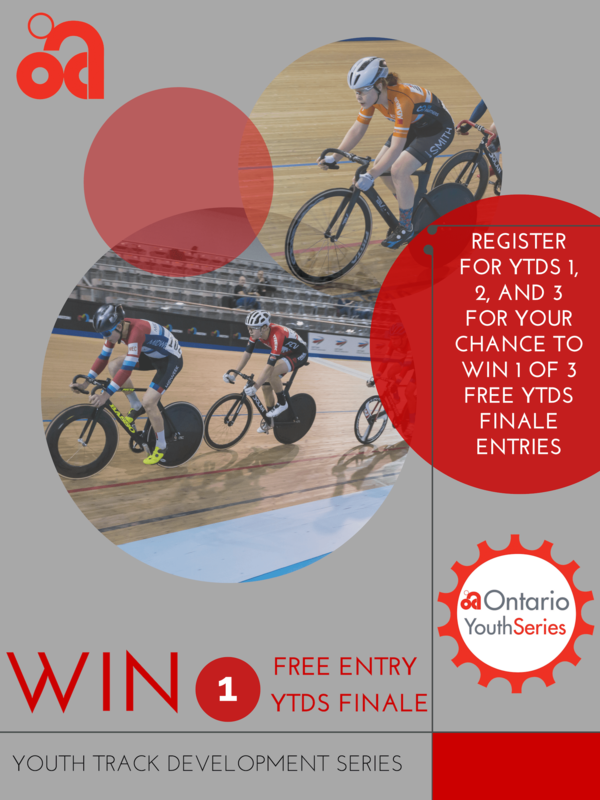 Youth Track Development Series Season Finale Free Entry Contest! Three lucky winners will receive one free entry to the Youth Track Development Series Season Finale on February 23rd, 2019! Riders MUST register for all three YTDS races in order to be considered for the contest. The prize is non-transferable and does not have cash value. The three lucky winners will be provided with a unique coupon code that will give them one free registration to the final race of the season. Register for YTDS #1 now until Tuesday, November 27th @ NOON! Registration for YTDS #2 and #3 are coming soon. Draw will take place on Monday, January 28th, 2018. Winners will be notified after the draw and will be provided with the registration coupon code. Visit www.ontariocycling.org or follow @ontariocycling on Facebook, Twitter and Instagram for frequent updates. For more details contact the OCA office at (416)-855-1717 or events@ontariocycling.org.